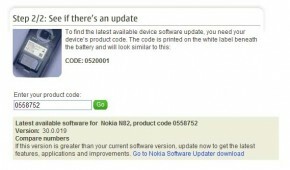 Following on from the Nokia N78, this time its the N82’s turn to receive a firmware update. The v31.0.016 weighs in at 118MB and is available via the NSU for most generic product codes. Although the N82 supports user data preservation, it is best to backup and then give it a go. The update contains no major changes and probably just brings bug fixes. Right after the update Steve seems to be having some problems with his N82 while others haven’t experienced any issues, so you might want to wait before you take the plunge. There’s nothing ground breaking that you will be missing. After the N95 Classic and the N95 8GB its now time for the N82 to get its v30 firmware. The v30.0.019 firmware for the N82 is now available for the Euro 1 product codes. The update is expected to be made available on other product codes shortly. The update will most likely bring improvements similar to those on the N95 8GB such as full the N-Gage client, Google plug-in for search, Maps 2.0 amongst other improvements and bug fixes. The update is available for 0558752 and 0558655, so if you can’t wait, just change the product code and update. Following on from the first part of this series of ‘real world’ N82 reviews through which I try and bring you impressions friends and family after they used the N82. My review of the N82 can be found in parts here, here, here & here. Jump over for the second review in this series. I recently got my hands on the beautiful looking N82 Black. It isn’t different at all from the N82 silver but the colour alone adds another dimension to the device and makes it much more appealing. Since I had already reviewed the N82 in parts here, here, here & here, I decided it would be best if I could get you another prespective on the device – a real world prespective. What people who are new to S60, or lets just say as into it as I am, feel about the device? With that in mind the N82 Black was handed over to friends and family for their take on what it in my opinion is one of the best Nseries devices ever made. Jump over for the first review in this series. The N82 with the killer looks is in the house. It is just BEAUTIFUL and at this point I will shut up and let the pictures do the talking. Loads of shots below. If someone were to go out and decide that he or she wanted the top Nseries device that practically did everything, most peoples’ advice would be to get an N9x device. After all they are Nokia’s flagships and you would think that they’d be the best device to get hold of. However while the above might have been true six months back, I would have to think hard, before I say yes to the above. Now let’s examine the current market setup. The N95 had been Nokia’s top dog for over a year and was easily the most feature packed device ever made at that point in time. However, it became old news with the launch of the improved N95 – The N95 8GB (N95-2), the heir apparent to N95’s throne. But meanwhile Nokia also released a handset called the N82 which practically can do everything the N95 can and in fact does it better; thereby putting the 8G’s claim at stake. This post, along with pictures, looks at both the devices and we try and reach a verdict.